It would seem a pretty logical addition to a WWII battle group to have one of more tugs for the capital ships (heck, any ship), yet I don't see much evidence of that. Let me elaborate. I was an Army officer for support company. If I recall correctly (it was a LONG time ago), we had several wreckers whose jobs was to retrieve tanks or other vehicles that had been disabled. A couple were fully armored and capable of towing the heavy tanks of the day (M60A3 and M1, just introduced) under fire if necessary. 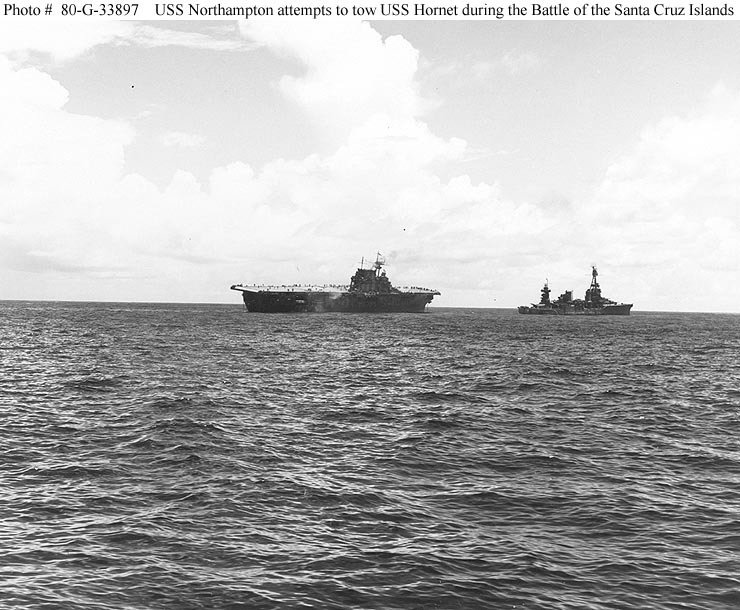 I have been reading about several incidents in WWII involving US capital ships: Yorktown, Hornet, and Chicago. They were crippled and trying to make it to safer waters. Of the ships, only the Chicago was ever towed by a tugboat (the equivalent of my wrecker) and not at first. Without a tugboat, ships like the Yorktown could only be towed at 3-5 knots, but I hear of Navajo class tugs with speeds better than 15 knots. Under load I haven't been able to find a source but I would think it much better than 3-5 knots. The US Navy certainly had ocean-going tugs during the Second World War. 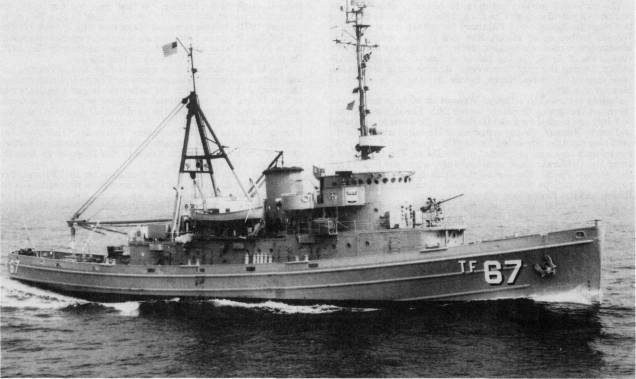 One example you mentioned was the Navajo-class, or Cherokee-class ocean-going fleet tugs (ATF), another were the Abnaki-class fleet tugs. 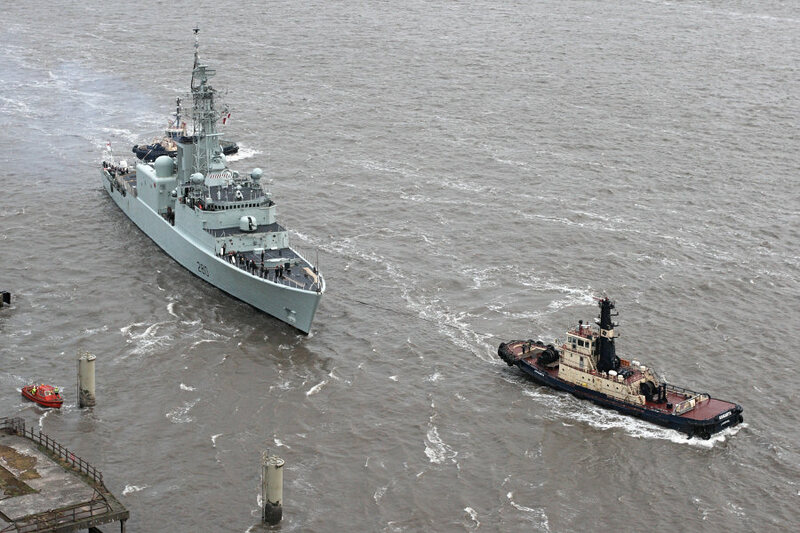 These vessels should not be confused with harbour tugs which perform a completely different function. Even given a top speed close to 15 knots, and a range of up to 6000 miles, these vessels couldn't come close to matching the speed of large naval vessels which could make over 30 knots. In addition, even though most of these vessels weren't completely unarmed, they were certainly only lightly armed compared to most combat ships. For operations where speed was essential (the Battle of Midway being a great example), there was no way that one of these vessels could accompany a battle group, no matter how useful they might have been once combat operations began, and in their immediate aftermath. served as part of Task Force 31 for the invasion of Bougainville in 1943, as part of Task Group 31.2 for an assault on Emirau Island in the Bismarck Archipelago in March 1944, and at Guadalcanal the following month. She then joined Task Group 53.1 in June 1944 to assist in the invasion of Saipan. In these cases, the relatively slow speed and light armament of the ATF were not a significant disadvantage. If you're interested in the operation of fleet tugs during the Second World War, the paper Fleet Tugs in World War II by Cmdr. Edward H. Lundquist may also be of interest. Preparations for Operation Overlord, the allied invasion of Normandy began in August of 1943. The operation itself took place 6 Jun 1944 – 25 Aug 1944. Almost every boat available was thrown into the mix. Perry Adams of San Carlos, California, arrived at the former summer resort, Lee-on-Solent, just across from the Isle of Wight, in March of 1944. Adams was a Purser/Pharmacist's Mate on the tug, MV Farallon, which carried a crew of 32 mariners plus 11 Naval Armed Guard. During World War II the men of the Royal Navy’s Rescue Tug Service considered themselves neither fish nor fowl. You need to take into account the effect of slow tugs on battle groups. If they remain together the max speed of the group is that of its slowest boat. 15 knots is darn slow by WW2, or even WW1, warship standards and would severely limit long distance deployments like in the Pacific. Tanks on the other hand are often, at least in the initial assault phases, before deep penetration exploitation, less likely to outrun their support vehicles. A "friendlier" environment to your concept, and more akin to your example of tank retrieval, would be near coastal operations, like in the North Sea during WW2. Tugs were often attached to convoys that were expected to come under attack, particularly when rescue ships were not available. The problem is that being neither merchant ships nor escorts, they were usually left out of the official reports. 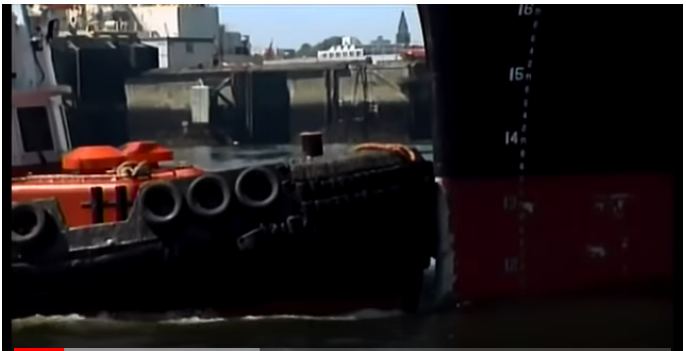 A tugboat doesn't pull, or tug, it's load; rather it pushes it with that padded front end. Their purpose is to nudge large ships around cramped harbours due to those ships having no steerageway at such low speeds. Their very low freeboard (height of gunnels above the water) makes them completely unsuitable for open water use, even though mush of the interior is compartmentalised. As they work entirely within the confines of small harbours they have no use for large fuel tanks, and consequently an operational range measured in hours rather than days and weeks. Further, they would be a severe liability in a naval battle due to their complete lack of armament or self defence. Also, paradoxically, large ships are capable of much faster speeds than smaller ones, due to the cube-square law (until strength of materials fails, of course). Top speed for a tugboat is typically about 14 knots, while top speed for open water vessels is above 30 knots; more than twice as great. Top speed for a tug under load. 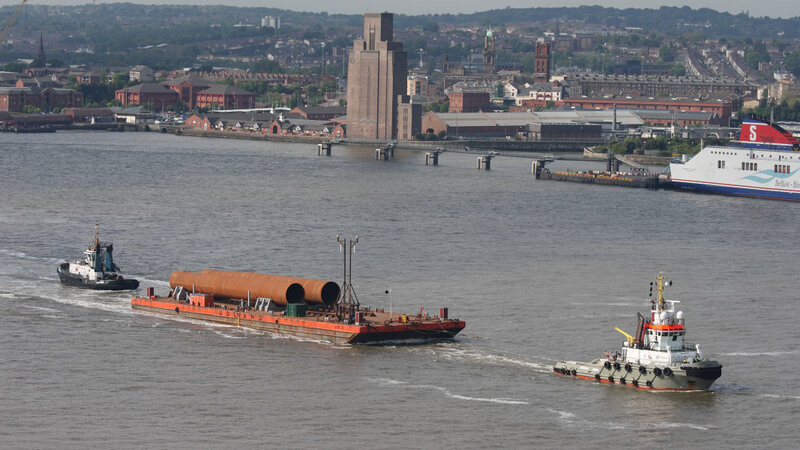 pushing a vessel orders of magnitude heavier, will be a tiny fraction of top speed, if only because the load vessel is no longer aerodynamic when being pushed sideways. To consider one of your examples, Midway, the as the crow flies distance to Pearl Harbor is about 850 NM; at least 84 hours travel time out for a tug at top speed, plus however long for one or more refuelings. Then several times that, at least, coming back with load. No port can be without its tugs for so long when other large vessels are constantly coming and going. Not the answer you're looking for? Browse other questions tagged world-war-two navy or ask your own question.